Color, 1958, 88 mins. 7 secs. Color, 1973, 104 mins. 59 secs. Color, 1977, 112 mins. 59 secs. The definitive Saturday matinee movie, The 7th Voyage of Sinbad inspired waves of impressionable little kids to go into the special effects business and made Ray Harryhausen a cinematic god for fantasy fans. A pioneer in the art of stop motion animation, Harryhausen had already made an impression with his black and white sci-fi spectacles like 20 Million Miles to Earth and It Came from Beneath the Sea. 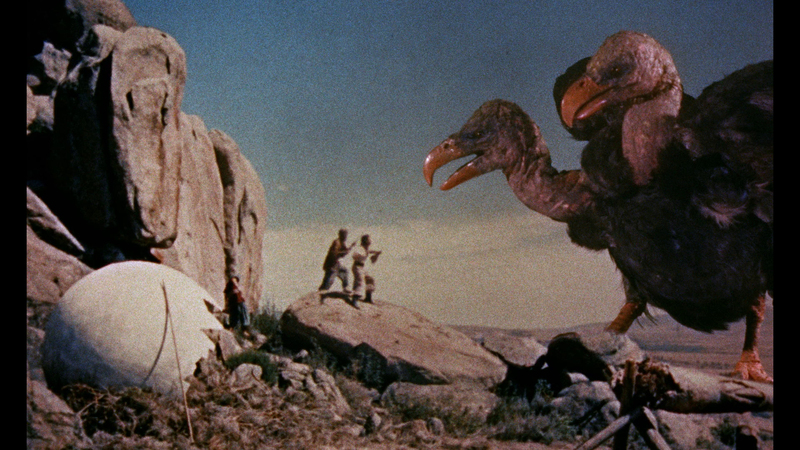 However, Sinbad offered the first time his effects could be seen in vivid color, and even better, Harryhausen provided a whole slew of imaginative creatures, rather than one simple octopus or alien. 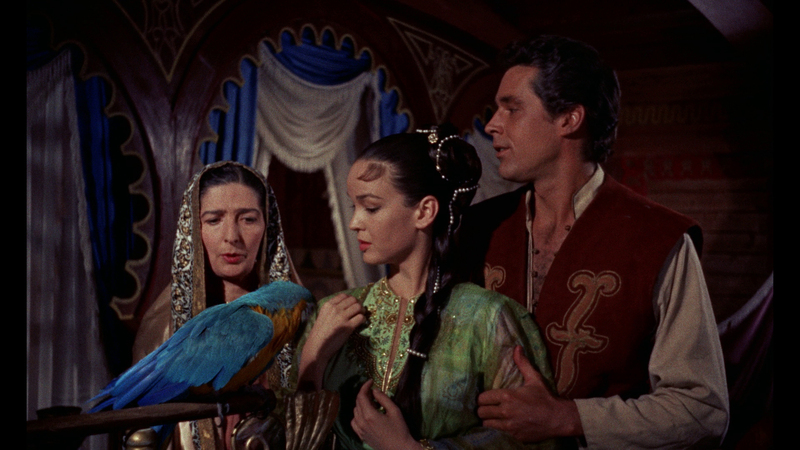 Sinbad proved so popular that Harryhausen remained busy doing other fantastic literary adaptations and two more highly enjoyable Sinbad adventures. 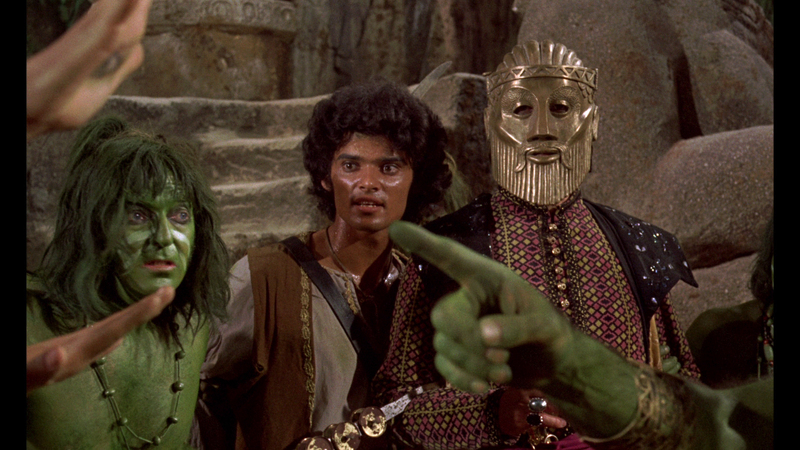 Arriving with his crew at the mysterious island of Colossa, Sinbad (Mathews) encounters a shifty bald magician, Sokurah (Thatcher), who uses his magical powers (including a child-like genie, Baronni) to help the men escape from a beastly cyclops. 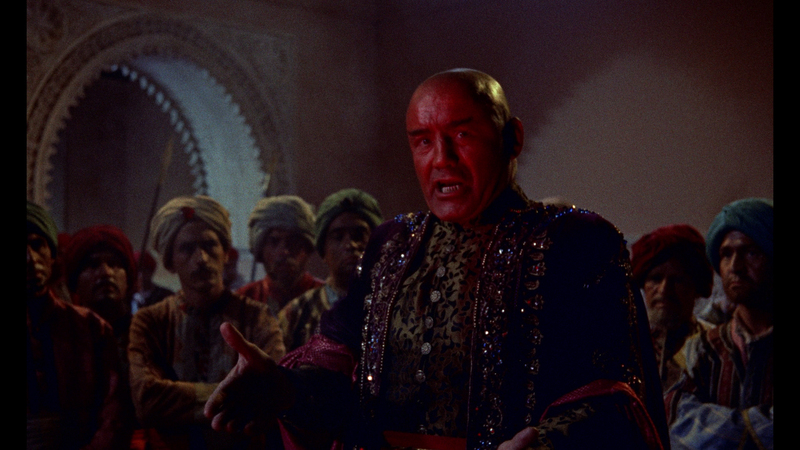 However, the magician loses his magic lamp on the way back to Baghdad, and he insists that they return to Colossa. To get his way, Sokurah shrinks the Princess Parisa (Grant) down to miniature size and abducts her. The only potion which can restore the princess to normal size requires a fragment from the egg of a Roc, a mythical giant two-headed bird. Sinbad and his men embark on an adventure to retrieve the Roc egg, save the princess, defeat the magician, and deal with any monsters they may encounter on the way. While Harryhausen is obviously the major creative force behind his films, some credit should really be given to his directors, too. Doing his best work here, director Juran had already proven himself on 20 Million Miles to Earth and showed an expert hand with turning junk into fun drive-in fodder (The Brain from Planet Arous, The Deadly Mantis, Attack of the 50 Foot Woman, etc.). 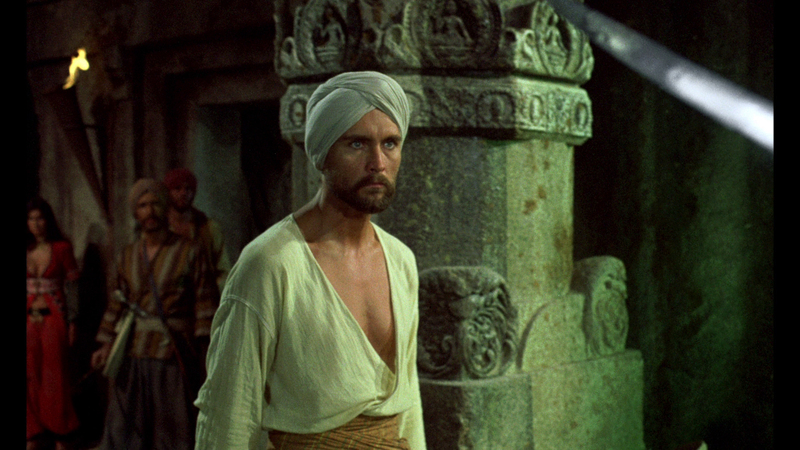 While Sinbad isn't as beautifully paced and lyrically executed as Harryhausen's crowning masterpiece, Jason and the Argonauts, it really was the first of its kind and still delivers everything it promises. 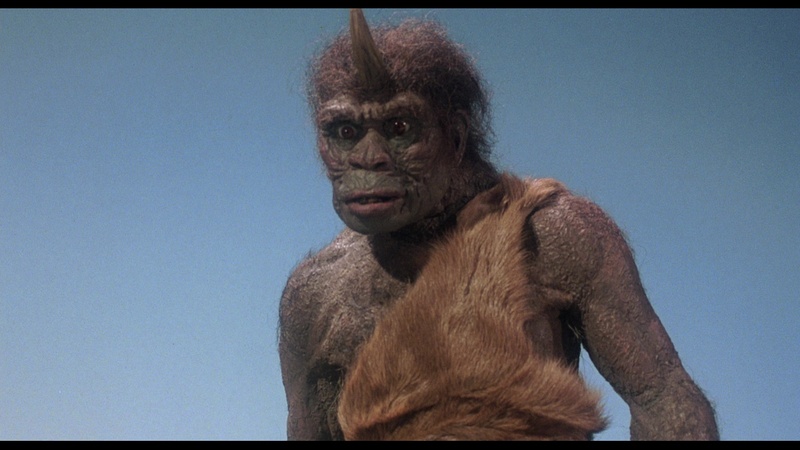 Kerwin Mathews is the first of Harryhausen's unorthodox, non-muscular heroes who use their wits and personalities to deal with obstacles, though they manage to come through with sword-swinging in a crisis. The famed skeleton battle is still the highlight of the film (repeated even more effectively in Jason), but all of the creatures are memorable and ingeniously executed. 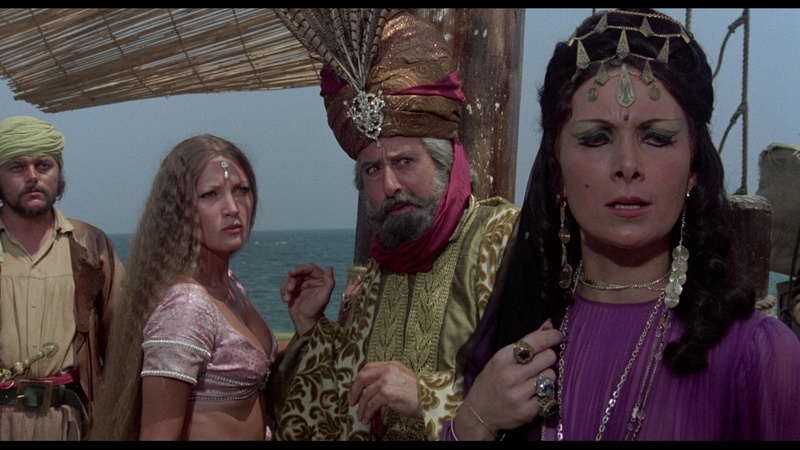 Thatcher makes a terrific villain, and Grant's fetching princess makes Sinbad's quest all the more believable. Of course, the rich, roaring score by Bernard Herrmann doesn't exactly hurt, either. Columbia's 2001 DVD of Sinbad was generally satisfying but matted the film to 1.85:1, which is pretty severe for some of the compositions. Previous video incarnations were completely unmatted at 1.33:1 and allowed plenty of breathing room, but this edition looks very tight. The mono audio is fine and clear throughout (oddly, the alternate Portuguese track contains a completely different main title cue) but seems lower quality than the robust stereo track prepared for the Pioneer Special Edition on laserdisc and Columbia's subsequent Sinbad box set. 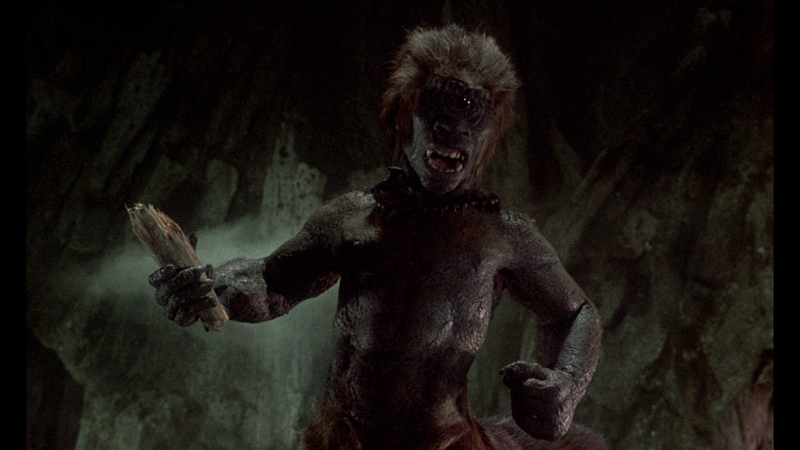 In the extras department, that DVD featured "This Is Dynamation," a 3-minute featurette produced to plug the release of Sinbad, while an 11-minute television interview with Harryhausen and the John Landis interview from the DVD of Jason and the Argonauts disc are included for more recent examinations of Harryhausen's craft. The Leonard Nimoy-narrated TV special "The Harryhausen Chronicles" (57m56s), a treasure trove of creature feature tidbits, examines all of Harryhausen's big screen work and includes some peeks at the various time-consuming technical processes used to bring his models to life. 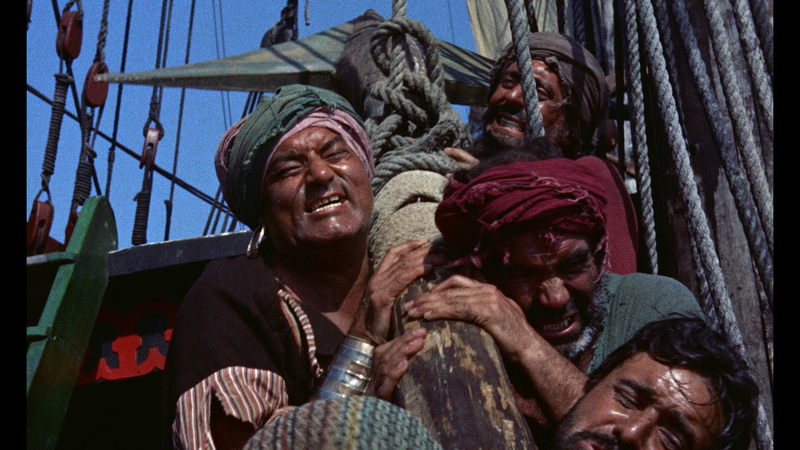 A large helping trailers ranging from 3 Worlds of Gulliver to The Golden Voyage of Sinbad rounds it out. Sony brought the film to Blu-ray in 2003 as a standalone release and as part of a three-film Harryhausen set, thankfully opening the framing up to 1.66:1 and featuring a Dolby TrueHD 5.1 mix, Dolby Digital 2.0 stereo, and French and Thai tracks, with optional English (standard or SDH), French, Spanish, Indonesian, Mandarin, Thai, or Korean subtitles. 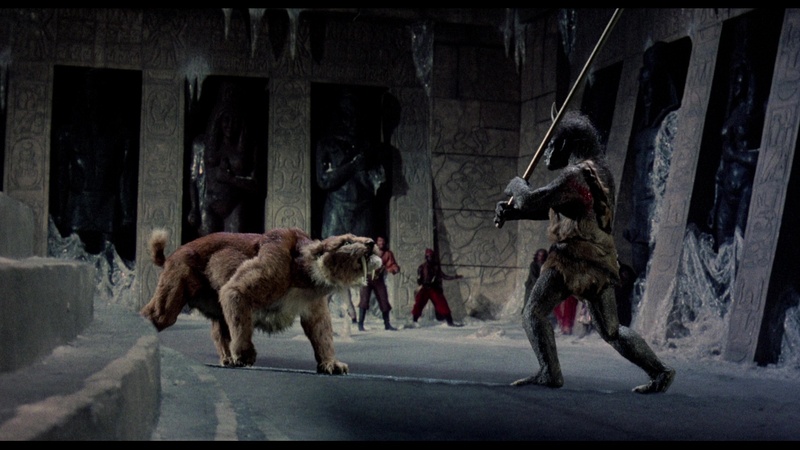 The big extra here is an audio commentary with Harryhausen, visual effects artists Phil Tippet and Randall William Cook, author Steven Smith, and Arnold Kunert, covering the innovative effects in tremendous detail with notes about the trial and error process and the extreme amount of time devoted to bringing the non-human characters to life. "Remembering the 7th Voyage of Sinbad" returns Harryhausen in front of the camera for a 23m31s exploration of the film's creation in less detail, while "The Harryhausen Legacy" (25m32s) offers an appreciation of the maestro's craft with admirers like archivist Bob Burns, directors John Landis, Frank Darabont, and Joe Dante, visual effects artists John Dykstra, Dennis Muren, Stan Winston, Tippett, Ken Ralston, the Chiodo Brothers and Hoyt Yeatman, makeup legend Rick Baker, and several more expounding on their favorite moments and the impact the films had on their craft. 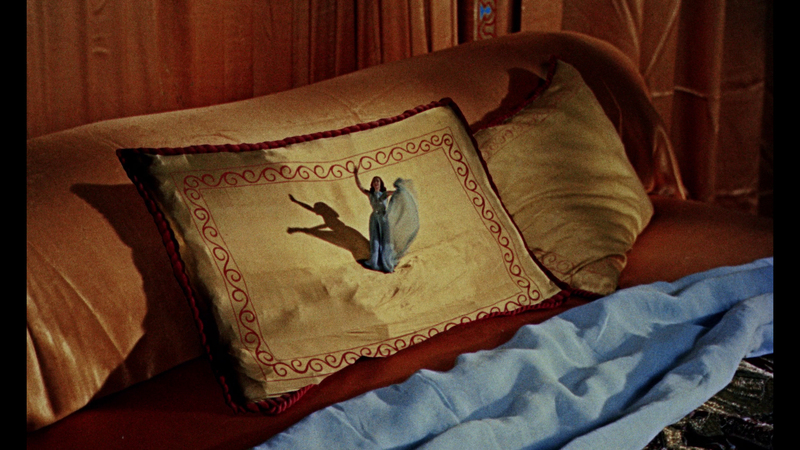 "The Music of Bernard Herrmann" (26m52s) features biographer Steve Smith summarizing the famed composer's impact on fantasy filmmaking with his thunderous score here and some of his other fantastic cinema scores including 3 Worlds of Gulliver, also with Harryhausen. "A Look Behind the Voyage" (11m52) is a vintage TV featurette with Harryhausen and Mathews recalling the film's shoot in Granada and the groundbreaking work they achieved with their opulent fantasy classic. An odd 1957 45 single created to promote the film called "Sinbad May Have Been Bad, but He's Been Good to Me" (2m34s) is a fun little lounge number (thankfully never included in the actual film! ), a brief vintage "This Is Dynamation" promo touts Harryhausen's process (and has been included on several home video releases of his films), Landis returns for a more general 12-minute chat with Harryhausen about the golden age of fantasy films, and a gallery covers an assortment of lobby cards and posters. Bizarrely, the HD transfer on the Blu-ray is one of two commissioned by Sony, with a completely different one appearing on the now-defunct Monsters HD channel (which was 1.85:1 but featured stronger colors and detail); it still looks good here but left quite a bit of room for improvement. Fortunately the definitive release of this film arrived in 2017 as part of a Sinbad trilogy collection from Indicator, boasting a new restored 4K transfer from the original negative and featuring an eye-popping, beautiful presentation. Colors look rich and accurate, blacks deepen, and film grain resolves better and looks more natural, particularly during the stop-motion sequences which look more convincing and organic here than before. The same DTS-HD MA 5.1, audio commentary, and isolated score options are present (with optional English subtitles), but the original mono has been thankfully reinstated here to convey how this film originally sounded in theaters. The big difference is Herrmann's score, which is spread out to the all the front and rear channels on the 5.1 mix for an experience that sounds a lot more like a live orchestra performance than a normal confined studio sound; try both and see which one you prefer, but it's great to have a choice. The bit rate is also extremely high, often maxing out at over 40Mbps and easily scorching any prior release. Carried over from the past release are the "Remembering," "Look Behind," and Herrmann featurettes, plus the promo song (everything else is scattered among the other two Blu-rays). The new "The Secrets of Sinbad" (11m23s) features Tippett waxing nostalgic about how the film changed his life and inspired him to start making his own films while developing an appreciation for Famous Monsters of Filmland and trying to use his close vicinity to L.A. to unravel the trickery behind the film's effects. Tippett also offers a vintage VHS happy birthday message to Harryhausen (57s), while trailer options include an original "This Is Dynamation!" version either standalone or in a Trailers from Hell version hosted by Brian Trenchard-Smith, plus a reissue version from the '70s with a G-rated MPAA card. 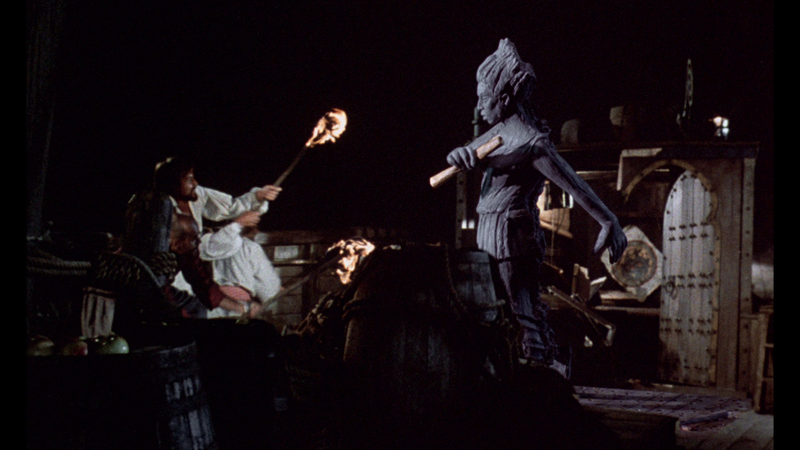 Fifteen years after the release of 7th Voyage, an entire generation of effects artists had been inspired to take Harryhausen's ideas to a new level in both studio and indie films. 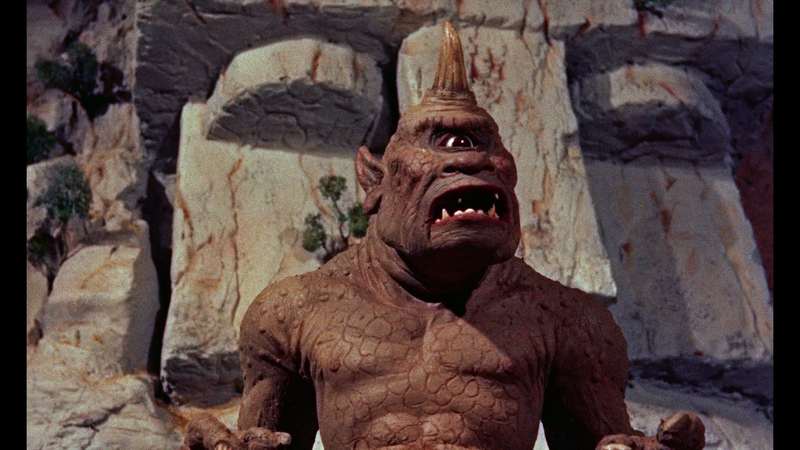 Harryhausen decided to revisit his most popular hero with a brand-new production, The Golden Voyage of Sinbad, which began the tradition of using a different director, star, and composer for each film in what would become a trilogy. (It also started the unofficial trend of baring as much female skin as possible within the then-lenient confines of a G rating.) 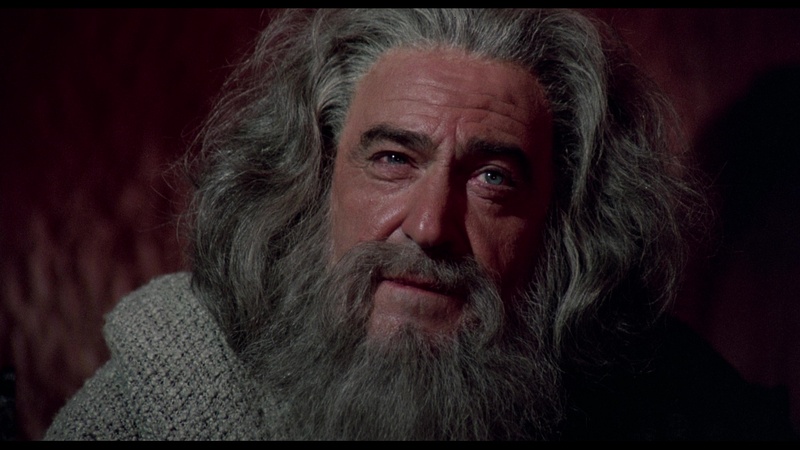 John Phillip Law (Barbarella, Danger: Diabolik) grew out a beard and sported an earring as the adventurous sailor, who retrieves a golden ornament from a flying homunculus during an ocean expedition. 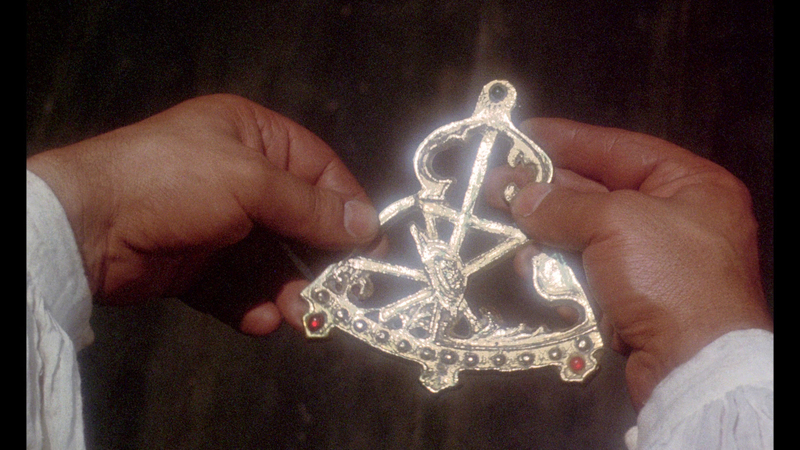 The discovery's supernatural connections are immediately obvious when Sinbad decides to wear the sparkly gold treasure as a necklace into town and discovers it's tied to a nefarious sorcerer, Prince Koura (Baker, fresh off of Nicholas and Alexandra and The Canterbury Tales and a future Doctor Who based on his role here), who wants it back for his sinister plans. Sinbad and his men end up visiting the island of Isor to see a gold-masked oracle capable of unlocking the mystery, only to be taken prisoner instead and forced into battle with a giant centaur. Also involved is a Vizier (Wilmer) who possesses the other half of the ornament, which is actually a mystical map, and a slave girl named Margiana (legendary scream queen Munro) with an eye tattoo on her palm that proves valuable in their quest. 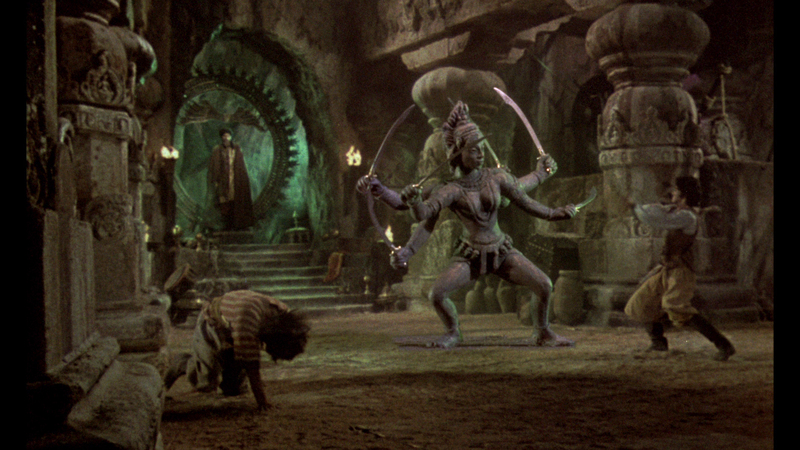 The biggest production helmed by Gordon Hessler (whose filmography ranges from Scream and Scream Again and The Oblong Box to Pray for Death), this film was pivotal in initiating a new wave of kids to Harryhausen's magic and has since inspired debates over which of the first two Sinbad films is better. It's certainly an imaginative and atmospheric film, and though his acting abilities drew more than their share of barbs at the time, Law makes for a memorable but much colder Sinbad here with an impressive physical dedication to his action scenes. That's especially useful in the spectacular battle with an animated statue of the goddess Kali wielding a sword in each of her six arms, with other stop-motion wonders including a ship's living masthead. Miklos Rozsa's grandiose score is also a major asset and just as dynamic as Herrmann's work (albeit very different in approach), while ace cinematographer Ted Moore (who shot all but one of the Sean Connery 007 films) gives the film a dark, moody look that offers a nice change of pace from the brighter visuals of the previous decade's Harryhausen films. 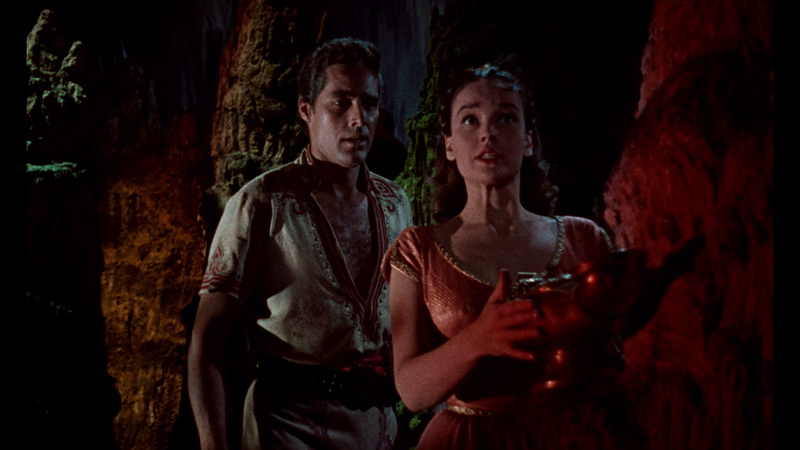 Golden Voyage first appeared on Blu-ray in 2013 from Twilight Time, featuring an isolated score track, a DTS-HD MA 5.1 English track with optional English SDH subtitles (no original mono), the theatrical trailer, and unrelated featurettes about Mysterious Island, 3 Worlds of Gulliver, and Earth vs. the Flying Saucers. The Sony-provided transfer from a 2K restoration is a real knockout with gorgeous colors, very vivid detail, and a rich sense of depth throughout. The Indicator release is from the same excellent source and looks very similar, albeit with an even higher bit rate that gives it a bit of an edge in motion. Audio options include the original mono track (LPCM), a DTS-HD MA 5.1 remix, an isolated score track (DTS-HD MA 2.0 stereo), with optional English SDH subtitles. Also included as an alternate track is a 90-minute 1970 audio interview with Harryhausen and producer Charles H. Schneer from the National Film Theatre in London. It's a very in-depth chat covering topics like the gradual decline of the star system, the level of violence acceptable in these films, the challenges of developing believable characters through Dynamation/Dynarama. The theatrical trailer is included along with an extensive sills and poster gallery, but there's a wealth of new video material here as well starting with a new Tom Baker interview, "Golden Years" (37m3s), which covers his career in fantastic cinema with a focus on this film including the other role he was originally intended to play, memories of the shoot in Spain, and the challenges of acting with swords, with thoughts on his theater work as well. The wonderful Munro appears in "Golden Girl" (15m5s) offering her own perspective on how the film made expert use of the natural landscape and the wonder of watching Law and the stunt men doing the elaborate Kali battle. 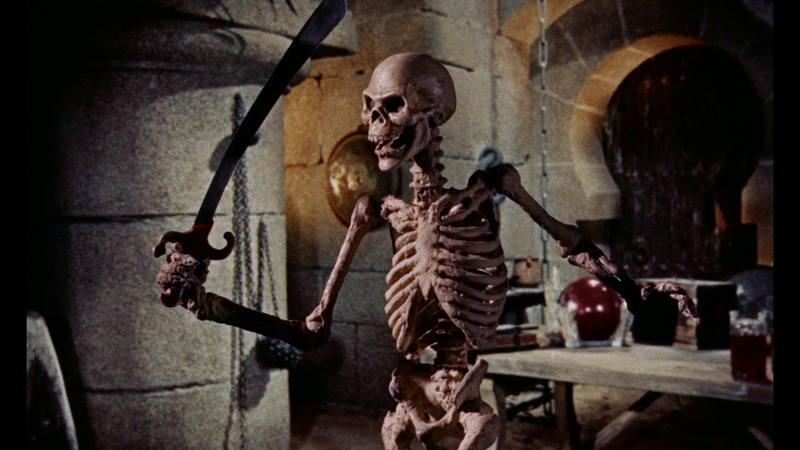 "The Harryhausen Legacy" is ported over here, and four different Super 8 versions of the feature ("Sinbad and the Oracle," "Sinbad Battles the Monsters," "Sinbad Duels the Magic Sword," and "Sinbad Duels the Idol with Many Arms") focus on highlighting certain episodes rather than trying to cram the entire narrative into nearly eight minutes. 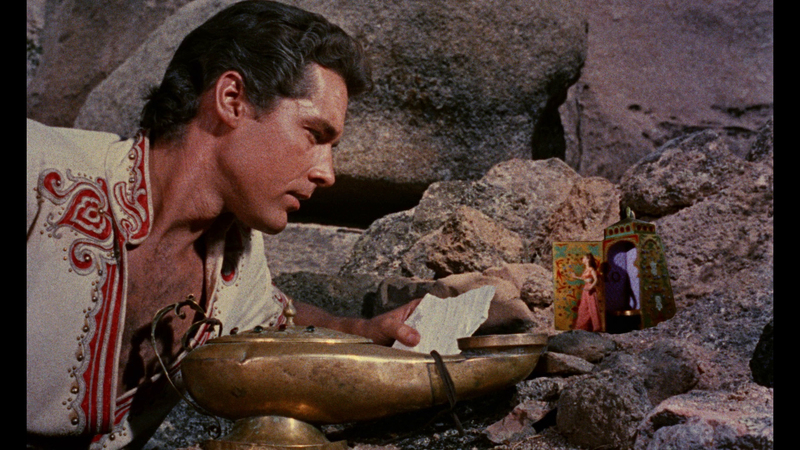 The final Sinbad film (and the penultimate Harryhausen feature, followed by Clash of the Titans) was Sinbad and the Eye of the Tiger, which featured a third actor in the title role in the form of Patrick Wayne, son of John. Generally regarded as the least of the series, it's still great fun if a bit too languid in its pacing at nearly two hours. Here Sinbad is called into duty when the wicked sorceress Zenobia (Whiting) turns her stepson, the new prince about to be coronated, into a baboon so that her own son might ascend instead. Sinbad intended to propose to the prince's sister, Princess Farah (Seymour), but the duo and the ship's crew are soon besieged by Zombia's forces of darkness including murderous undead creatures and her own shapeshifting abilities. After finding another helpful accomplice in young Dione (Power, daughter of Tyrone), our intrepid heroes must head to a magical, polar wilderness where they hope to undo the evil spell that could plunge the kingdom into darkness. Filled with a wide variety of creatures ranging from a troglodyte to a walrus and a saber-toothed tiger, this outing is more low key in tone with a focus on exotic settings and colorful supporting characters including another Doctor Who, Patrick Troughton, playing Dione's father. 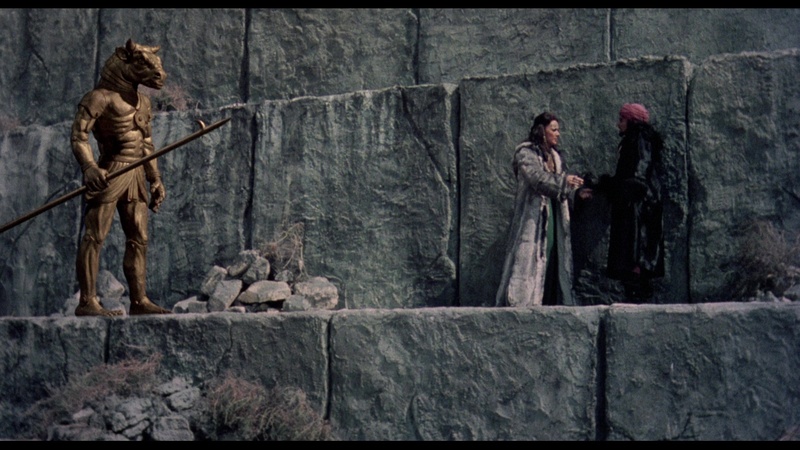 Like the other films, this was primarily shot in Spain where Harryhausen had a home, and it has a pleasing old-fashioned atmosphere that unfortunately clashed with moviegoers when it opened the same time as Star Wars. However, it found an appreciative young audience through frequent TV airings and home video where its menagerie of creatures (including a very well-animated climax involving the tiger) could be better appreciated even if the end result felt more rushed and ragged than the prior two entries. A Twilight Time Blu-ray of Eye of the Tiger popped up in 2013 at the same time as Twilight Time's Golden Voyage disc, also with only a DTS-HD MA English 5.1 option, an isolated score track for the music by Roy Budd (Get Carter, The Italian Job), the"This Is Dynamation" featurette, and the theatrical trailer. Again the Indicator expands considerably in the extras department and features a sterling 2K-sourced transfer from Sony, which presents the film in the most immaculate quality possible as long as you take into account that there's more dirt and grit baked into the rear projection stop-motion footage than either of the previous two films. (Note: the first pressing featured a darker, more muted transfer compared to the Twilight Time, reportedly due to a different master delivered, but the more vibrant version is currently available as a repressed disc. Grabs in this review are from the second pressing. Anyone wishing to replace their current Blu-ray disc of SINBAD AND THE EYE OF THE TIGER should contact Powerhouse Films at info@powerhousefilms.co.uk providing proof of purchase and confirming the unique number of their limited set (as given on the rear of the bellband, 'xxxx/6,000'). The isolated track and 5.1 mix are present here along with the original mono, with optional English subtitles. Also available as an audio track for the film is an interview with Harryhausen by Philip Strick in 1981 at the National Film Theatre, tied in with the opening of Clash of the Titans and covering his entire career with a great deal of discussion about his Columbia films and the Sinbad cycle, with an especially interesting passage about how he had to create animal movements for creatures that hadn't been tamed (such as the baboon in this film). Extras on the Indicator release include the Landis-Harryhausen interview and "The Harryhausen Chronicles" (from the U.S. 7th Voyage disc), plus the memorable theatrical trailer and a gallery of stills and promotional material. The new "The Princess Diaries" (11m38s) is a really charming discussion with Seymour, who explains how she was hired just after Live and Let Die because of her "ethnic" appearance at the time only to find her part chopped in half when Power came on board. Her stories about her costume, her nightmare hairstyle, and being in awe of Harryhausen's "secret" process (which forced her to imagine the monsters without any reference) are all worth hearing. Limited to 6,000 units, the box also includes a beautiful and much thicker than usual insert book featuring essays on each film by Michael Brooke, compiled oral histories with comments from the participants (including Harryhausen, Juran, Schneer, Mathews, Law, Munro, Wayne, and Budd), plus oral history looks at the unmade fourth film Sinbad Goes to Mars and a breakdown of the Dynamation process. Updated review on October 15, 2017.